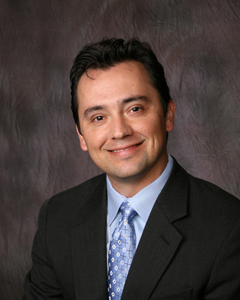 Board certified in Orthopaedic Surgery and Spine Surgery, Paul Saiz, MD, specializes in all disorders and diseases of the spine as President of the physician team at Las Cruces Orthopaedic Associates, in New Mexico. The center is the largest provider of orthopaedic services in southern New Mexico and one of the premier providers throughout the American southwest. Paul Saiz, MD, is the only surgeon in New Mexico to have received fellowship-level training in spine and tumor surgery. After earning his MD in 1995 from the Baylor College of Medicine in Houston, Dr. Paul Saiz served his surgical internship and his orthopaedic residency in Phoenix, Az. Before entering private practice, he completed a year-long fellowship in spine surgery (Sonoran Spine Center) and another in musculoskeletal oncology and reconstruction (Rush-Presbyterian Chicago, Illinois). Dr. Paul Saiz has helped design spinal hardware at Zimmer Spine and is involved in consulting with various spinal companies. He has become a world renowned expert in the use of trabecular metal in the spine (Trabecular metal, a unique man-made material used extensively in orthopaedic surgery, which resembles bone and approximates its properties and characteristic). Dr. Saiz has been involved in professional research throughout his 10 years of practice, and has authored or co-authored articles in several peer-reviewed journals. He has given dozens of presentations to audiences of his peers, most recently on Porous Tantalum Applications in Spine Surgery. In addition, he recently returned from a teaching trip in Brazil, where he gave instruction on a new implant system. Dr. Paul Saiz continues to travel and recently gave lectures in Boston for the North American Spine Society Coding Committee as well as K2 Spine in 2016. Bi-lingual in Spanish and English, Dr. Paul Saiz is very popular with his patients and participates in several community events. He is a generous supporter of the Las Cruces Catholic schools, sponsors a local youth soccer team, CFC Bones, and helps coach local teams. His other passions include wine, with recent winery trips to Spain, South Africa, Peru and Chile.